Fun and Fancy Free (film) Jiminy Cricket begins the film by playing a Dinah Shore record that tells the tale of Bongo to cheer up a desolate-looking doll and bear. Bongo, a circus bear, meets and falls in love with a girl bear named Lulubelle. But first he must confront a bear rival, Lumpjaw, whose looks match his name, before he wins her. When the story is completed, Jiminy finds he has been invited to ventriloquist Edgar Bergen’s house where he is entertaining Luana Patten, Charlie McCarthy, and Mortimer Snerd. Bergen tells the story of Mickey and the Beanstalk, in which Mickey and his friends, Donald and Goofy, climb a beanstalk to rescue the lovely singing harp from a giant to restore happiness to their Happy Valley. As Bergen finishes the story, the giant appears, lifting the roof, in search of Mickey Mouse, then goes on down the hill toward Hollywood. Released on September 27, 1947. Directed by William Morgan with animation sequences directed by Jack Kinney, Bill Roberts, and Hamilton Luske. 73 min. 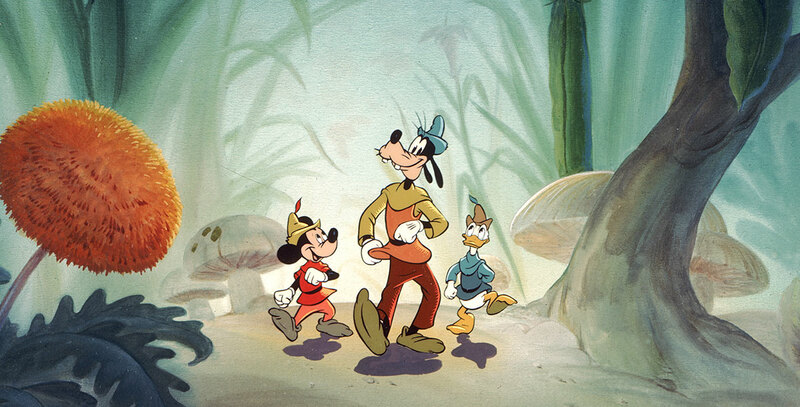 Songs include “Fun and Fancy Free,” “My, What a Happy Day,” “Fe Fi Fo Fum,” and “My Favorite Dream.” The opening song by Jiminy, “I’m a Happy Go Lucky Fellow,” was originally written and recorded for Pinocchio. Billy Gilbert did the voice of the giant. Jim Macdonald began doing the voice of Mickey Mouse in this film when Walt Disney became too busy. In the 1960s, Disney animated new introductory material of Ludwig Von Drake and his pet, Herman, to replace Edgar Bergen when the Beanstalk segment was run on Disney’s television show. Released on video in 1982.